Days Two and Three of Canada Reads have come and gone. 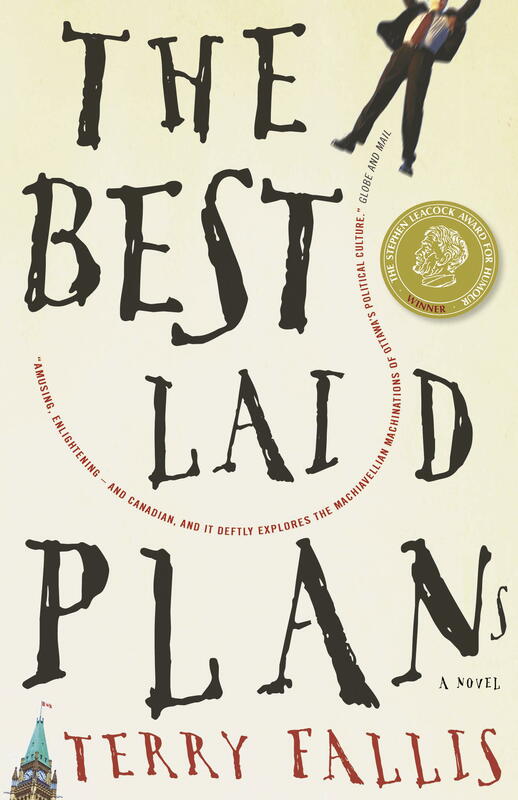 Terry Fallis’ book The Best Laid Plans is the winner. That is just about all I’m going to say about that. I have been heartened in the past days to see so much insightful, funny and honest commentary on Canada Reads… it makes my job that much easier. It felt, for a while, as if were the only one writing about this stuff; I wondered, sometimes, if it wasn’t easier for me to do it because I don’t have a place within the established literary circles, or publishing, or radio… I’m just a blogger, you know? I have no real vested interest except for that which is concerned with being able to live in a culture that respects books and writing, that privileges writers and well… takes this stuff seriously. Random shelf in downstairs hallway. No order, definitely no dewey decimal system. They’re arranged whimsically, and I read ’em all. Cherry Ames Dude Ranch Nurse, please meet Louis Althusser. my life, and like Nancy Pearl and her Rule of 50, I don’t feel guilty about it. That said, there are very few. Confession: never, ever, was able to finish Old Man and the Sea (10th grade reading assignment). Nor have I managed to finish Eat, Pray, Love (Gah! so bad). I say I’ve read The Brothers Karamazov, but now I can’t actually remember if I finished it. There’s nothing wrong with any of that. We’re all allowed our personal opinions. That’s cool and I want to keep it that way. In a contest, though, such as this they have set rules. Criteria that they need to take into account when they judge a piece of writing. Sara Quin said it during the post-game show — that in the end “it’s a job” — they had criteria and she had to work within those rules. I can’t, and won’t, say I agree with her choice, but I like that she worked within the rules of the game and that she took her job seriously. That everyone had a different idea of what those rules were is clear, though, and problematic. I’ve been getting really caught up in this, so want to take a step back. I don’t want to nit-pick every little bit of this, because (thank god) other people are offering up reportage and play-by-play of what happened yesterday and today. There are some really great blogs out there talking about the competition now, and about the books, and giving their really smart comments and analysis. Do a tag search, and you’ll find tens of sites, all with interesting fresh things to say about this show. I’m more interested in a comment that Debbie Travis made in the post-game show, about a conversation she had with Ami McKay. I’m paraphrasing, but she said that Ami told her there’s a “code” of conduct — that authors don’t talk down other author’s books. Jason McBride wrote a great article about this in the December 2010 Quill & Quire. His question was “Is honest criticism possible in the tight-knit world of CanLit, where everybody knows everybody else?” and it’s a good question to ask. It’s pertinent to this space, here, because I know the whole Canada Reads gameplay thing has made it very difficult for people in the literary community. That difficulty trickles down to little wee blogs like Box761 — I can get 300 hits on a posting, and not a single comment. People don’t want to talk about it, not out loud, anyway, and certainly not in public. Debbie Travis said it herself — that her job was to say what the writers can’t. That said, though, did Debbie or any of the other panelists do that? I think not. It was an exercise in diplomacy, all around. Even when one of the panelists didn’t like a book (or even finish it), their stock phrase was “it didn’t move me” or “it’s not my thing”. Not a single person there said “the writing wasn’t great, and I wonder how it got into this contest” …. something I’ve wondered about a couple of these books (and no, I’m not going to tell you which ones). Instead, they latched on to these ridiculous arguments about how x book is better because it will help teenagers read more, or it will encourage more people to go into trades… wtf? Since when is Canada Reads about making teenagers and “semi-illiterates” interested in reading? Since when does that mean we dumb down the entire canon of great literature in Canada? That we privilege “easy reads” over great writing? Argh. What has bothered me from the very beginning is this sense I get that all of this is just so much filler… something to drive hits to their site. Someone, somewhere, in the bowels of CBC decided that hits to the site and tweets with the #canadareads hashtag were the indicators of success for this process. The part of this competition that got the least amount of air time was the books themselves. I know what each author thinks is a great gift for christmas, and I know more about what some random Canada Reads “team” thinks of the books than I care to know. I read about the Canada Reads Dinner Party Contest, and what five select bloggers think about Canada Reads blah blah blah. It was incessant, the noise coming from the Canada Reads portal. What I didn’t see, until day two or three of the actual competition, was anyone really talking about the books. And before you think I’m just snarky for the fun of it, I want to go on record here –it wasn’t all that bad. On Days 2 and 3 I wasn’t able to listen to it in real time (life intruded), so I was able to have a leisurely stroll through the replays, and it felt almost-kinda-maybe like they were sorta-almost getting to the point where there was some interesting commentary on the books themselves. Jian Ghomeshi was really great (though seems ambitious — is he bucking for a tv show?) and he moderated it ably. He wasn’t great at hiding his biases, but that’s okay. The debaters were — by the end of the competition — doing better at actually discussing the books themselves. In fact, during the post-game show, I found them all to be very appealing and smart. During Day 3’s pre-show live audio feed, they were delightful and real. I liked them by the end of it all. 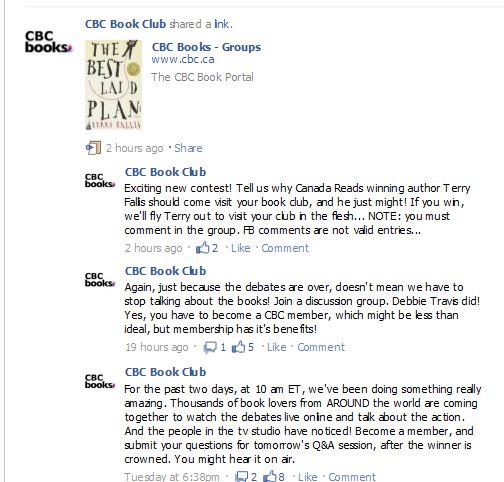 I am swayed, against my will almost, by the comments in the live chat — people wrote things like “I could barely sleep last night because of anticipation” (weird), and “love the talk about canlit, this is great!” and “I’m going to go out and buy these books”… these are things that I cannot deny. Canada Reads does have a strong influence. All the more reason, though, to take seriously their responsibility toward keeping the tone of it respectful, of not selling out to the lowest common denominator, and of not making a spectacle of themselves just to get hits. Just like all 10-year old children, Canada Reads needs to understand that any attention is not good attention. They could take all of that frenetic social media energy and use it for good. Respectful, author-empowering, calm, informative “edutainment” (shudder. I couldn’t think of another way to say it. Forgive me) that will by its very nature help Canada read more. This has been a difficult post to write. I despise the frantic, empty, exclamation mark-happy prattle that they’re serving up. I abhor the Hunger Games-ishness of it all, and find myself wanting to tell the grown ups over at CBC what their kids are doing while they aren’t looking. I find it impossibly frustrating that by all accounts this has been the most “successful” Canada Reads ever — largely because they are gauging that success by counting hits and click-throughs and memberships in the CBC Book Club, etc. I am torn, because while I complain about all of this, I also bought all five books and read them and found myself delighted by a few of them. I saw the chat scrolling down, full of people emailing from all over Canada and beyond… I saw that it was really something that people loved. I don’t really get it, but I’m willing to concede it. I haven’t been slagging on Canada Reads for all these months for no reason. It’s because I really thought — and still do — that they could be doing it better. That whether they like it or not, the CBC is in the position of great power to shape culture, to further appreciation of writing, and to model respectful behaviour toward those who create that culture that CBC is disseminating. Next up? The Bookies. Sigh. The Bookies? I bet that’ll be good. Give ya 2:1. I’m a Canadian author. I write SF&F. If Quill and Quire thinks the Canadian literary group is small, try being a part of the speculative fiction community! A bunch of them live down the lane from me. For accessibility, as I said before, was the original point of Canada Reads to find accessible, loved books, or greats lofty tales of literary fiction? If we’re truly lucky, both will cross paths. Otherwise, I figure let the competition be what it originally was meant to be about. Then, have another to encourage all Canadians to read. Get them reading some fantastic science fiction and fantasy (Canada has some of the world’s best SF authors…love short stories? Dough Smith’s Chimerascope collection is one of the best works of writing period that I’ve come across). Get them to read some YA, a bit of Atwood, a little Farley, etc. Stay de-lurked, Krista. Love the comments. I’d like to clarify a few of things, since my name was attributed to the “code of conduct” comment in reference to authors not talking “down” about other authors’ books. It was, as such comments often are, taken out of context. Although occuring during a conversation with Ms. Travis, my comment was in response to her musing about to how hard it would be for writers to be on the panel defending their own books. What I said to Ms. Travis was that I felt writers shouldn’t “bash” the works of other writers (ie: cut down a work through means of illformed arguments and re-tweetable snark.) Personally, I think such behaviour is non-productive and outright lazy. It does nothing to further the place of literature in our society and, if anything, it keeps us from true, meaningful conversations about books. Further, I did not and would never ask Ms. Travis or anyone else to speak on my behalf about another author’s work. Although I spoke with her about the history and research behind my novel, her opinions and comments about the other books in the 2011 Canada Reads debates were her own. In the course of the conversation I went on to say that there is, or at least I hope there is, a code of understanding between writers that would discourage such sound-byte criticism. Writers spend endless hours arranging and rearranging words, hoping to bring the thing that’s nagging the back of the brain to some sort of tangible, meaningful whole. We know, no matter what genre or form we choose to embrace that it takes great courage and dedication to put those words on the page in the first place. We know what a fool’s folly it seems to send them on to an agent or publisher. We know the joy and simultaneous fear that comes when our work arrives, at last, before the public. Knowing all this, I feel it’s an author’s responsibility, when asked to comment or review another writer’s work to be, above all, thoughtful thorough and fair. What I long for, (as I think every writer does,) is a fair reading of my work, followed by thoughtful commentary. We have a muscular, versatile language with which to describe and order our understanding of any given work. The “code” I hope for, if you will, is one where writers respect the process by taking care to craft criticism that matters. Honesty is essential. (I appreciate it far more than tepid, confusing phrases like “what the book was trying to do.”) But, simply saying “the writing wasn’t great,” or “I wonder how it got into this contest,” isn’t enough. It may seem fresh or bold to make such statements or ask such questions, but if they are not followed with an honest, considered attempt to discuss the work, then, I argue, very little, if anything, is gained. That’s all the change I’ve got in my pocket today. Thanks so much Ami — that’s a lot of change! I agree with you completely, and I hope you didn’t think that I am suggesting “the writing wasn’t great” is adequate as commentary…. The point I was trying to make was that there was very little carefully crafted (or otherwise) commentary about the writing on this program. What I hope for is the same thing you mention: thoughtful, thorough, and fair commentary. We did not see that on Canada Reads. Oh, I didn’t think that’s what you were suggesting at all 🙂 I just wanted to add to your thoughts and say that we (as writers anyway, since I don’t care to speak for anyone else) need to be devoted to going the distance. Sorry if I deviated from the intended subject of your post, BTW. I just saw the opportunity to comment on the idea of “author as critic” and thought I’d weigh in. Thanks for the space! No deviation at all — it’s really what the whole thing is about. Just a quick side question. You said that on Days 2 and 3 you weren’t able to listen to it in real time due to life intruding and so caught up on the replays, yet you also said that during Day 3′s pre-show live audio feed you found the panelists delightful and real. Is the pre-show live audio available somewhere to listen to? I’ve not been able to find it, only the ‘official’ broadcast. Thanks very much. Hi Shannon. I listened to that part in real time…. I was at my computer listening prior to the broadcast, just getting set up and settling in to begin, and heard it (if you go back and read the live chat, someone mentions it, too). There was maybe five minutes, tops – just chatty, relatively unmediated commentary. Then real life intruded for me and I wasn’t able to get back to the show until right around the time when the post-show started. VERY frustrating, I have to say, but am glad the replays were there!